"Dave again. Sorry for the long delay between posts, but things have been "interesting" here . . .
We sent the second 24-hour and 48-hour runners off at 9:00 a.m. Matt Watts finished his 24 leading that race with 117+ miles . . . In the 48-hour, Tracy Thomas . . . has a comfortable lead over last year's winner Hans Bauer . . . We'll see whether any of the first day competitors can mount a charge, and how the second set of 48-hour folks do as they move up through the ranks . . . In the 72-hour, perennial winner John Geesler led early, but [a heel spur] on one foot [has] really taken [its] toll, and he's dropped several spots down the leader board . . . Achim Heukemes and [Scotland's] William Sichel were right there to grab the lead. Juli Aistars has looked very good since the start and currently has a 10-lap (5km) lead over Dagmar Grossheim. On the younger front, Aaron Doman, 11 (son of Wendell Doman and Sarah Spelt) is doing well. He comes out, runs a while, goes off to play with some of the other kids for a while, then comes back to run some more. He's shooting for 100 in 72 hours . . ."
RD Paul Bonnett (L) and Host Rodger Wrublik congratulate Anne Watts for reaching 100 miles. Matt Watts (white shirt) led at the end of the first day with 117 miles. Nattu Natraj (red jacket) got 101 miles. Continued from the last entry . . .
Jim was in good spirits when he returned to the track again on Tuesday at 6 AM. (Technically, it was still Day 1 until 9 AM but it's easiest for me to start at this point with the Day 2 entry.) He completed about 65 miles before his second nap of the race and was eager to get going again now that the sky was starting to lighten up -- it was like that invigorating "second sunrise" effect on runners in a trail 100-miler. It also helped that he had no problems keeping warm during the night. Last year he was running on the first night, which was colder than any of the other nights during the race last year or this year. In 2007 his feet hurt so much that he couldn't move fast enough to stay warm. He got hypothermic and lost a lot of time because he had to go into the heated tent several times to get warm. (He didn't want to wake me up in the camper because I was running the second day.) This year his feet were in better condition the first 24 hours, the night-time desert temperatures weren't as frigid, and he was able to stay warm and comfortable. The two naps in the camper also helped him regulate his body temperature better. was reduced to walking most of the race with a painful heel spur but stayed the course. After Jim returned to the track I got dressed, ate breakfast, took care of Cody (who loved getting attention each time Jim came in during the night), and walked over to the Wrublik's house to take care of the runners checking in on Day 2. Only about fifteen runners came in that morning because the fewest number were scheduled to start that day and some had checked in previously. During lulls between runners I organized the remaining duffel bags and packets, inventoried the few race shirts and jackets that were left, and put some of the finishers' glass mugs in new silver lam� drawstring bags to commemorate the Silver Anniversary of the race. 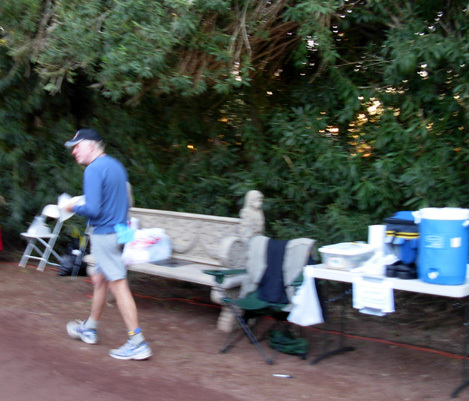 At 9 AM I was still busy making notes about registration for whoever would be doing that job the next morning and doggone it, I missed the start of the Day 2 runners: sixteen in the second wave of 48-hour race and five in the 24-hour race. I asked him later why he listed only his "best-case scenario" mileage goal on his split chart instead of also including his "realistic" goal like he usually does. My thought was that being unable to keep up with the "fantasy" goal (his term) would only discourage him as the race wore on and he fell further behind. I discovered yet another difference in our thought patterns and strategies: Jim said the chart motivated him to keep trying, even when he knew it wasn't realistic that he'd suddenly find a high gear that would propel him to the more lofty goal. Maybe I just don't set my sights high enough. I walked/ran a few laps with Jim off and on during the day to keep him company and to see how he was doing. It gave us time to talk without him stopping too long at our aid table. 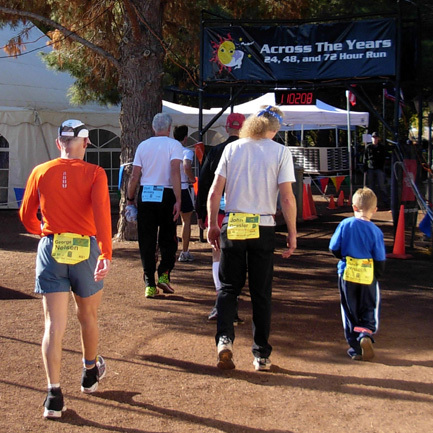 Crew members at ATY are permitted on the course as long as they don't impede the progress of other runners (i.e., they should stay on the outside of the track). It was fun to watch friends and family members circling the track with their runners, usually when the runners were in walk mode. 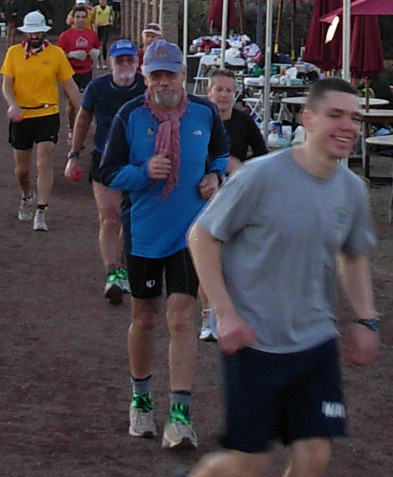 72-hour runners John Hobbs (L), William Sechel, and ultra-walker Ulli Kamm on Day 2. Ulli's wife Traudl is on the right; she walked lots of laps with him. Handling registration the morning of Day 2 was my last volunteer job until after the race. There were enough volunteers to handle the aid station during the day so I was able to spend more time preparing for my race the next day, crewing for Jim, talking with runners, taking photos, and getting psyched to run. The latter was easy; in fact, I was chomping at the bit to get out there and run with everybody! That's about the only downside I found to running on the third day. I was busy filling Hammergel flasks and mixing up a couple bottles of concentrated Perpetuem for my race when Jim came in to take his nap. By that time I was ready to get some fresh air. I stayed outside taking photos and talking to the runners so I wouldn't disturb Jim. Colorful, happy group of runners pass by late morning on Day 2. Deborah Sexton (far L) and Gillian Robinson, both in the 48-hour race, are in the foreground. The nap definitely re-charged Jim for several hours. During the early afternoon he was running more of each lap and cranking them out faster. Like most of the other runners he slowed down some to accommodate the mid-afternoon heat. 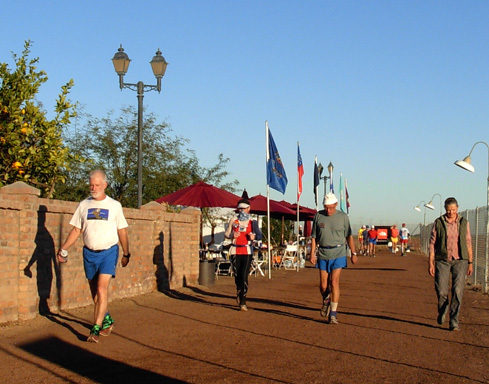 Very few of them were acclimated for temperatures in the the upper 60s or lower 70s F. Even though Jim and I were in Phoenix for several weeks the temperatures hadn't been that warm until race day, so both Jim and I were somewhat affected by the heat, too. "I TINK I BROKE. YOU FIX?" Around suppertime I wandered out to the track to see how Jim was doing. The shortest route from our camper to our aid table was in one door of the heated tent and out another. 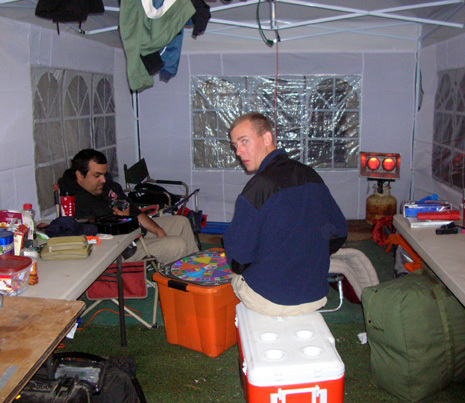 As I passed the corner of the tent where Christopher O'Loughlin, Nurse Extraordinaire, and Andy Lovy, Doctor Extraordinaire set up their massage table, chairs, medical supplies, and personal tents, I saw Dave Combs getting his feet taped by Christopher. I had to stop and watch. Christopher O'Loughlin, RN. Both ran the 72-hour race. This was Dave's first year to run the race after serving as the main timing person for several years. Like Chris and Andy, he was entered in the 72-hour race so he could perform his volunteer duties and still have time to get in some quality mileage. By his own admission, Dave's feet weren't trained for the distance he was running and he got blisters rather early in the race. By dinnertime on Day 2 he was past due for one of Christopher's professional foot taping jobs. Quality medical care by Christopher, Dr. Andy, and the Kachina Rescue Squad are hallmarks of ATY. The EMTs are there primarily for emergencies. Chris and Andy have more specific experience with the bodies and minds of ultra runners; they are ultra runners and they've also professionally handled many of the same problems over and over at endurance events. Blisters and overuse injuries (e.g., sore muscles, tendonitis, stress fractures) caused by repetitive motions over one, two, or three days are some of the most common problems they address. They also see a fair amount of dehydration, inadequate electrolytes, cramping, GI distress, nausea, hypothermia, and the mental desire to quit. 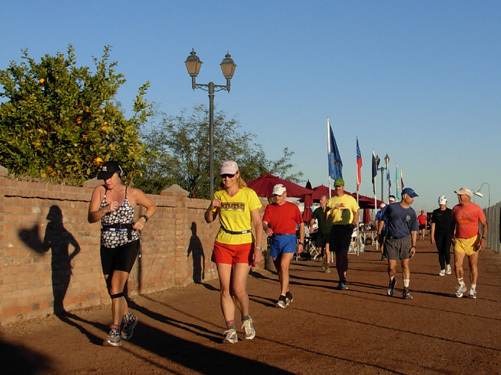 They are quick to diagnose and treat such problems, enabling the runners to crank out more miles than they could have without their intervention. Dr. Andy Lovy at the finish at the end of Day 3. Mike Melton (L) congratulates him. Both Chris and Andy have plenty of stories to tell about runners they've treated during races (keeping their identities anonymous, of course). Their legend sometimes precedes them. Dr. Andy laughs when telling about a female Italian runner who came up to him in an ultra and plaintively asked in halting English, "I broke. You fix?" I forget what her problem was, but I'm sure Andy did what he could to fix it! I decided that would be my opening line if I needed his services when I was on the track Day 3. Christopher O'Loughlin tapes Dave's feet as Chris' daughter Sinead observes. I watched and listened as Christopher expertly covered Dave's toes and the bottoms of his feet with Medipore tape, then carefully trimmed off the ends. He explained every step of the procedure so Dave and I could remember what he'd done and why. Chris ended with a promise that Dave wouldn't get any more blisters during the rest of the race (another day and a half). Dave's feet are all done; I got the same tape job two hours later. I made a major tactical mistake at ATY last year when I decided not to get pre-race foot taping done by Christopher. After watching him tape Dave's feet so quickly and thoroughly, I asked him if he could do mine. He asked me to return at 8 PM when he planned to take his next break. That was one of the best strategies I used this year. I was able to get my Injinji socks (the brand with the individual toes) over my taped toes, then added a thin pair of Smartwool socks over that on Christopher's recommendation. Previously I've worn thin synthetic socks on top of the Injinjis to further prevent blisters. Chris thinks wool socks make a more effective combination, so I tried that this time. Dr. Andy consulting with Tracy Thomas at her table on Day 1. Sometimes the runners need a little pep talk. That's nothing compared to what they do during the event. 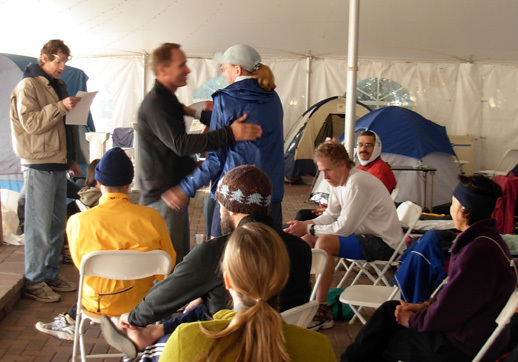 The two men usually sacrifice their own races as they duck into the tent any time a runner either tells them they need help or Christopher and Andy observe a runner in need of a massage, foot care, pep talk (Dr. Andy is a psychiatrist), etc. and encourage them to "come on in." Last year they kept me going two times when I was cramping from lack of fluids and electrolytes (particularly potassium) and once when I had a blister under a callous on my forefoot. I took up a total of about 90 minutes of their time and was very grateful for the relief and advice they offered. They helped dozens of other runners, too. This year both Christopher and Dr. Andy had personal race goals that were important for them to achieve. Chris really wanted to get his 1,000-mile jacket, which required him to run and walk a minimum of 121 miles and some change. 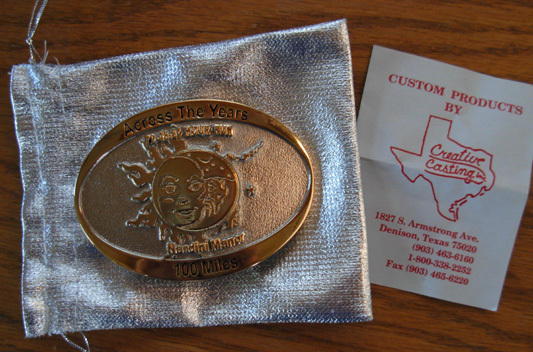 Andy's goal was to reach at least 100 miles so he could earn one of the beautiful new buckles. Christopher O'Loughlin (in blue) on Day 1. Learning about this, one of my goals became to not consume 90 minutes of their time again! It was heartening to see Dr. Andy work on more runners during the last night so Christopher had a better chance of reaching his mileage goal. They make a great team. Best of all, they both reached their goals at ATY this year. Meanwhile, Jim had been dealing with two blisters on his little toe for over 24 hours. After watching Christopher tape Dave's feet, I suggested he ask Chris to look at his foot and tape it up in a different manner so Jim could continue running more comfortably. Jim didn't want to bother Chris so he sought relief from the EMTs in the Kachina Rescue tent. when they were bored (a good thing!) and playing Trivial Pursuit. EMT Andy (not Dr. Andy) cleaned and drained the blisters again and taped his foot more thoroughly while Jim did surgery on a third pair of older Asics 2130 road shoes to accommodate the swelling and bandages. 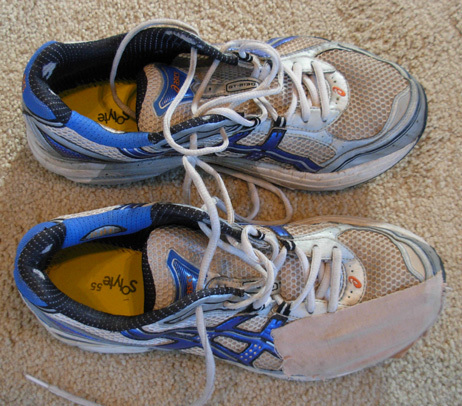 He cut out a piece of the shoe where it rubbed his toe and covered the hole with a piece of wide, stretchy Elasticon fabric tape to keep out grit from the track. You can see the shoes below, without his orthotic inserts. That modification and some ibuprofen worked to reduce the pain for several more hours. The bottoms of both of Jim's feet were also increasingly sore during the race, probably from bruising in the forefoot (metatarsal heads). I have this problem in really long ultras (oxymoron?? ), too. I attribute it to "skinny feet" with inadequate fat pads on the bottom, but it's probably a combination of our foot structure, biomechanics, and simple overuse since we never train 24 hours for a 24-hour race or 100 miles for a 100-mile race -- let alone a 48-hour training run for a 48-hour race! Endorphins, adrenaline, and synthetic painkillers don't entirely kill the pain and we either have to gut it out to the end or stop earlier than planned, as we both did at ATY last year. Andy Lovy told us about a material that's more protective than Spenco to use under our orthotics so we'll look into that. Near the end of the race Jim's feet were so sore that he tried wearing generic "Crocs" (below) but they were too inflexible to be comfortable on the track. Some 72-hour runners (Martina Hausmann, Rick Cheever, Christian Griffith, etc.) 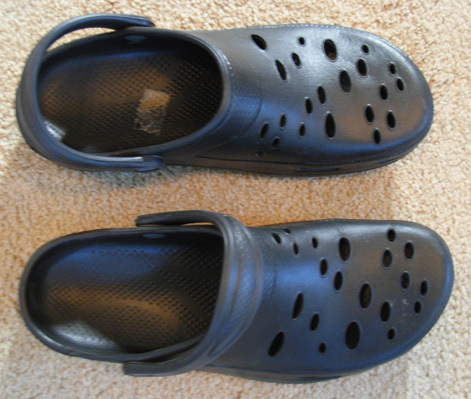 wore Croc-type shoes successfully for several hours on their third day but Jim didn't like them. Nor could he wear his Keen sandals; they rubbed his little toe too much. He finished the race wearing his doctored Asics shoes and continued wearing them for several days after the race while his toe healed. The longest distance Jim has ever run in a single ultra event is 100 miles or maybe a tad longer. Since mountainous trail ultras are impossible to measure exactly, some are more like 101 or 102 miles "just to be sure" no one is being shortchanged. He reached that milestone at ATY at 8 PM on Day 2, just after I went inside the big tent to get my feet taped by Christopher. Cool! Now he knew he'd earned one of the beautiful 100-mile buckles. He also knew he was in new territory both mentally and physically. He'd already been out on the course for 35 hours, including sleep and other breaks. Whatever distance he could cover in the next 13 hours would be time and miles and wear and tear that he'd never experienced before. That was part of the allure of doing 48 hours in the first place. It was a new challenge. By now, however, he was tired enough to be questioning the sanity of it all. Jim leaves our aid table late in the afternoon on Day 2. Less than a mile later, he decided to take another nap. It was dark, it was getting cold again and, well, a hundred miles is a lot of ground already covered. Jim wanted to rest and regroup for his final attempt at his goal. Lap #324 ended at 8:20 PM. We were both asleep soon after 8:30. I had ear plugs in both my ears this time so I could sleep more soundly the night before my race. I didn't hear Jim go back out on the track about 10 PM, ready to rack up some more miles. Even though he avoided some problems that have plagued him late in some other ultras, the second night proved to be a real struggle for him. This was definitely new territory for him. On the plus side, it was cold but he never got hypothermic. He had no problems with nausea, dehydration, cramps, tendonitis, or lack of energy. He continued eating and drinking. He was motivated mentally to accumulate as many miles as possible. Jim's main problem as the race wore on through the second night was foot pain and an overwhelming need to sleep. Remember, he'd never been "out there" for two nights before. Seeing how his mind and body would handle the second night was one of the main reasons he took on this challenge in the first place. at 5 PM on Day 2. Ninety-three miles! He returned to the camper three more times that night for naps ranging from about 40 minutes to two hours. I was soundly asleep and never heard him come or go. We both had our alarms set to get up at 7 AM on Thursday. That was the first time I talked to him since I went to bed at 8:30 Wednesday night. Jim felt better after his last nap; it was morning again and the end of his race was near. 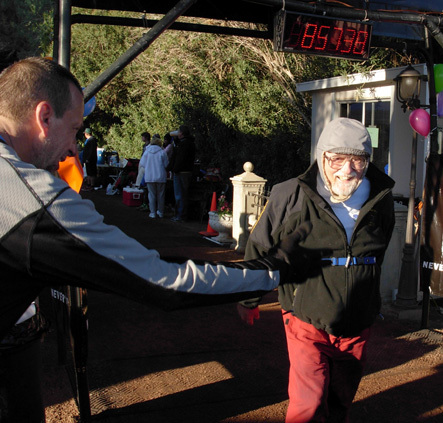 He was able to walk fairly steadily for another five miles before stopping at 8:50 AM with a total distance of about 116.2 miles, the longest he's ever run and walked in one race. 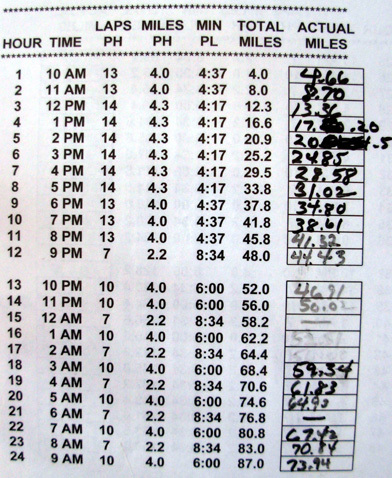 He placed third of seven runners in the first wave of the 48-hour race but had to wait another day to see how he fared after the second wave finished. (That's a disadvantage of running early in the race.) 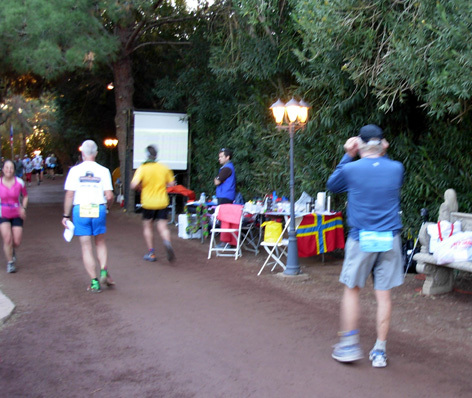 He ended up 9th of 21 runners in the 48-hour race, an excellent placement for his first two-day attempt. It wasn't as many miles as Jim wanted but I'm as proud of him as I'd be if he'd won the whole race! He told Rodger in all sincerity that his new ATY buckle (above) means more to him than any of his trail 100-mile buckles (even Western States and Leadville). I think that says a lot about ATY and Jim. He had the guts to try something new and difficult for him, gave it his best shot, and should be proud of his accomplishment. Great job, Jim! You'll notice there isn't a finish photo of Jim on this page. That's because he stopped while I was in my pre-race briefing and I wasn't out there to record it for posterity. When I came out he was sitting in the chair at our aid table, waiting to watch me start with the third wave of 24-hour runners. We hugged and kissed, congratulated/encouraged each other, and soon went our separate ways for the next 24 hours. I began my one-day journey around and around (and around) the track and Jim headed for the camper to wash off two days of grime and take a very long, well-deserved nap.